Hepatitis C is an infection that impacts the liver. It is spread through contact with the blood of an individual who carries the virus. Hepatitis C results in the inflammation of the liver and can potentially contribute to severe liver scarring. While the treatment of hepatitis used to necessitate the use of regular intravenous and oral drugs that came with serious side effects, the infection has become curable with the release of direct-acting antiviral medications that are used daily for up to 6 months. A majority of chronic hepatitis C infection cases begin with an acute stage. An acute hepatitis C infection typically goes unnoticed because it does not present itself with any symptoms. When the infection brings about symptoms, patients may experience fatigue, fever, muscle pain, nausea, and jaundice. Symptoms of an acute infection are typically experienced within three months of getting infected and persist up to 3 months. It takes about 2 weeks to 6 months for symptoms to appear after an individual becomes infected with hepatitis C. An estimated 64-85% of individuals who become infected with hepatitis C will go on to develop what is known as chronic hepatitis C. Some of the symptoms of acute hepatitis C include fever, dark urination, a loss of appetite, and joint pain. Jaundice is a possibility as well, along with nausea, stomach pain, and vomiting. Chronic hepatitis C is a serious condition that leads to symptoms such as rashes, weight loss, a change in appetite, jaundice, and extreme fatigue. A person must take a blood test to determine if they are infected with the virus. 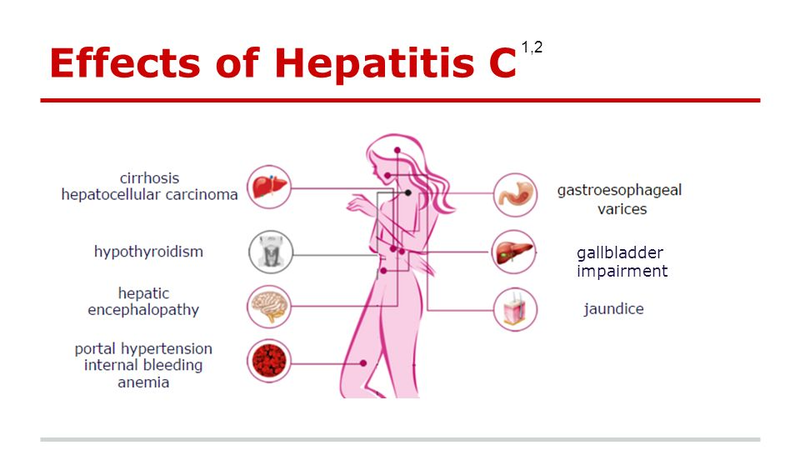 An imbalance in their liver enzymes also points to the presence of hepatitis C.
Hepatitis C is spread via contaminated blood and is highly contagious. In rare cases, a mother with hepatitis C passes the virus on to her baby during childbirth. Generally, sharing infected needles may lead to the transmission of the infection. Even though the risk of the infection getting sexually transmitted is low, there is still a chance. Organ transplants before 1992 were not screened for hepatitis C, so individuals who underwent an organ transplant procedure must also get screened for the virus. Hepatitis C may also occur due to sharing of personal items such as toothbrushes and razors with infected individuals. Interferon has properties similar to that of a protein that can fight off the infection. Pegylated interferon is used in combination with Ribavirin to treat hepatitis C. Pegylated interferon has a number of side effects (it is mainly used for genotype 3). Ribavirin is used in combination with interferon to cure the disease. It is taken orally and is now used in combination with newer, more advanced medicines to cure the disease. Technivie is used for the treatment of genotype 4. Technivie was approved for use in 2015 and is typically prescribed in combination with ribavirin for the treatment of HCV genotype 4 in patients without the effects of scarring and cirrhosis. It takes around 12 weeks for a full recovery. Daklinza is used for the treatment of genotype 3. Daklinza is the first drug that demonstrated safety and efficacy in treating HCV genotype 3 without the need for co-administration of interferon or ribavirin. It was approved in 2016 in combination with sofosbuvir to treat HCV genotypes 1 and 3 including challenging-to-treat patients who are co-infected with HIV-1 and those with advanced cirrhosis or post-liver transplant recurrence of HCV. Epclusa is approved for the treatment of adults with any genotype of chronic HCV. The treatment usually takes around 12 weeks. The initial trial testing yielded a 98% success rate. Using ribavirin in combination with Epclusa yields the best result. Approved in 2016, the most common side effects of Epclusa are a headache and fatigue. When Epclusa is given with ribavirin, the common side effects include fatigue, headache, anemia, nausea, insomnia, and diarrhea.